Your hazmat containers must meet government regulations pertaining to your specific chemical. Even the tiniest details of your hazmat containers are designed to increase safety, mitigating hazards so your hazmat storage is safe and maintained. Sometimes your materials require climate control. Sometimes they require shelter from direct sunlight. Here are a few more things to consider when designing your hazmat containers, and don’t worry – U.S. Chemical Storage has you covered. Our engineers will design you a building to suit your exact hazmat needs. 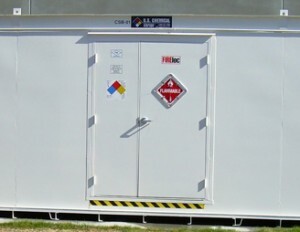 Hazmat containers should be designed to protect against specific hazards. For instance, you would not want to store fertilizers in hazmat containers designed to hold paint. You also wouldn’t want to combine the two unless you were certain there were no incompatibilities. Knowing what you intend to store and understanding your materials’ hazards will help you prepare for your hazmat storage endeavor. If your hazardous materials are flammable, you have a good idea what sort of precautions to take when designing your hazmat containers. Things like fire suppression systems, fire-proof electrical accessories, and climate control could help reduce the risks associated with a fire hazard. DOES IT PRODUCE TOXIC OR CORROSIVE FUMES? Mechanical ventilation is a great way to reduce the amount of fumes or vapors present within your hazmat containers. This allows your personnel to have access to fresh air even within your hazmat containers, and allows them to move around inside without risk of inhaling harmful vapors. If your hazardous materials are explosive, there are a number of steps you can take when designing your hazmat containers that will reduce the dangers of and explosion. Explosion relief construction is designed to be released after a buildup of pressure within your hazmat containers. Explosion-proof accessories are designed to be operated within your hazmat containers without increasing explosion risks. Oxidizers promote the flammability of flammable or combustible materials. It is important to separate oxidizers from any flammable or combustible chemicals to reduce fire hazards. When dealing with a fire, water-reactive materials may restrict the use of water in the extinguishing process. Dry chemical suppressors may be required to prevent violent or explosive reactions to water. IS IT HARMFUL TO THE ENVIRONMENT OR THE COMMUNITY? Certain materials, such as pesticides, are capable of getting into water sources such as rivers and streams, where it can affect wildlife, and groundwater, a source of drinking water for much of America. Designing your hazmat containers to effectively contain your hazardous chemicals enables you to safeguard your community, environment, and even your family from the adverse effects of toxic substances. These are only a few of the hazards associated with chemical storage, but they are very important factors to consider when designing your hazmat containers. Remember to consult your chemical’s Safety Data Sheet, as well as federal, state, and local regulations so you know all the proper procedures for storing your hazardous materials.